I read this article and found it very interesting, thought it might be something for you. 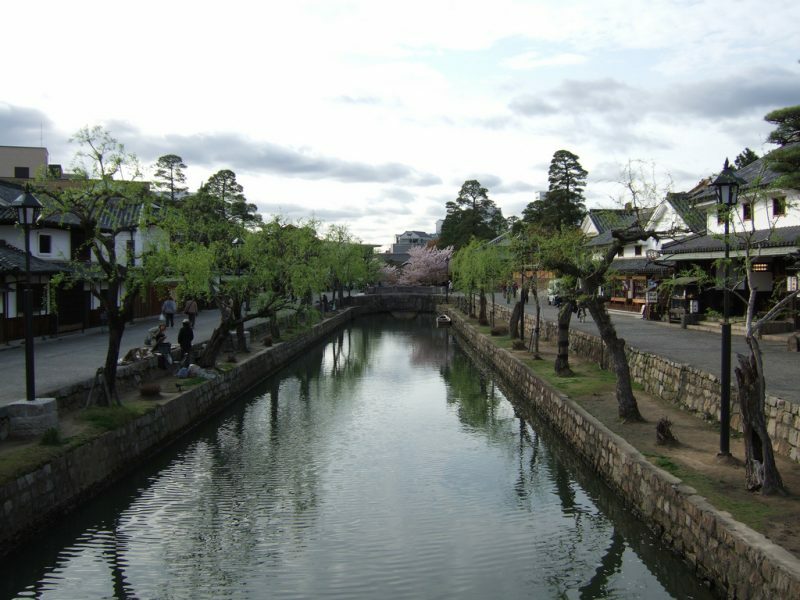 The article is called 30 Things To Do in Okayama and is located at http://trip-n-travel.com/listicle/15947/. 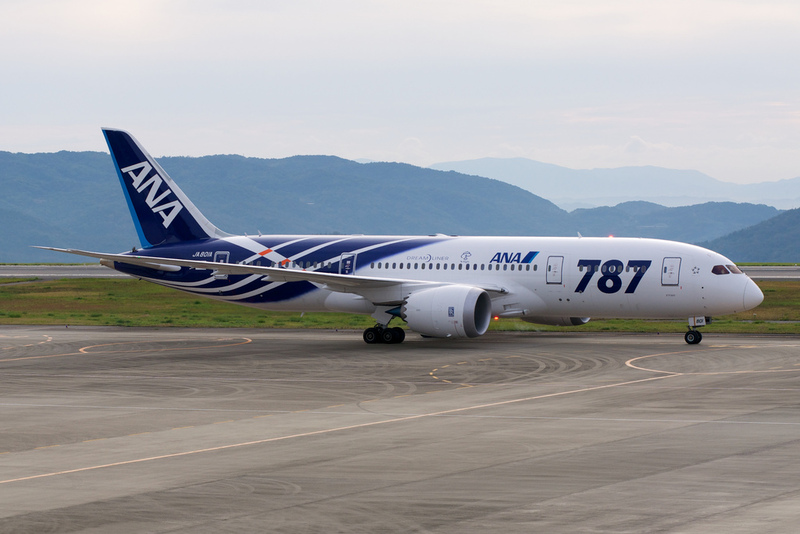 Okayama is a very small city, not very well-known and the travelers visiting Hiroshima or Kobe often just disregard it. Yet it is known for its wonderful white peaches and the story of a child born from one, as well as for its kind and friendly people. If you happen to be in the neighborhood, remember it’s well worth the visit. Here are some of the things you can see and do when you get there. 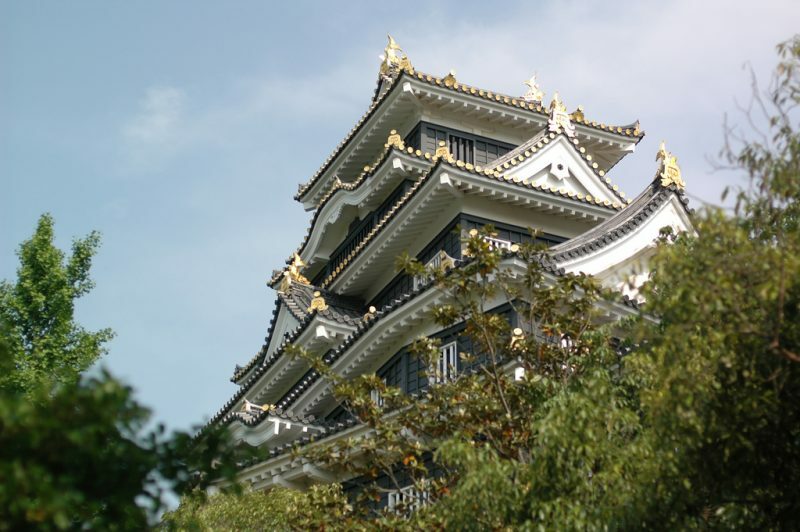 One of the city’s landmarks and a must-visit place in Okayama is the Castle built on the Asashi river bank. The castle overlooks the Korakuen Garden, and together they are recognized as a cultural ground. Once you get there, you will be impressed by the castle’s amazing exterior. Its dark black walls and the great decorated roof will leave you breathless. The castle is actually one of the rarely found black castles also called Crow Castles. Along with the stunning beauty of the nicely maintained grounds, you can enjoy one of the frequent exhibitions in the museum inside this beautifully rebuilt castle. You might find that this place is rarely visited by tourists, but if you decide to visit it, you will just love it. 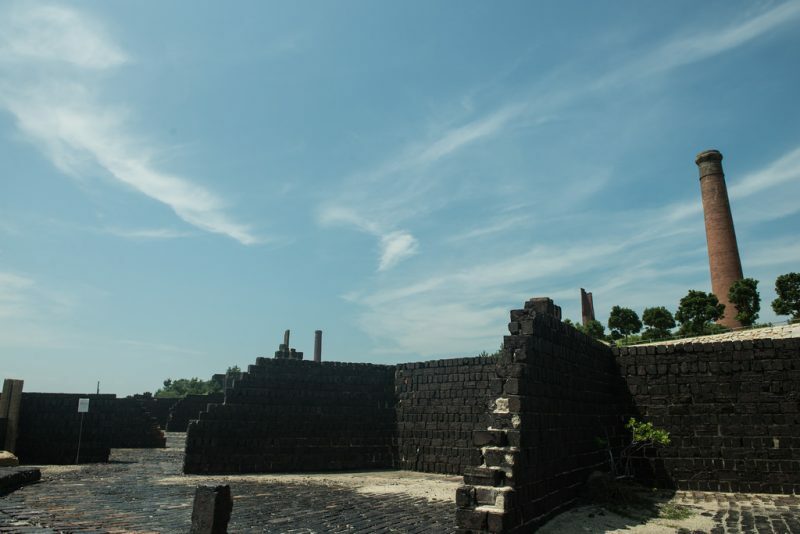 It is a place of unique architectural design and Okayama’s treasure. You will enjoy the walk through the nicely maintained grounds with beautiful gardens and walks while looking at the amazing monuments, woodworking pieces and especially the thatched roof of the shrine. 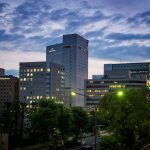 Should you happen to be in Okayama, don’t miss it! Inari shrines are very common all over Japan, but not all of them are highly ranked as this one. 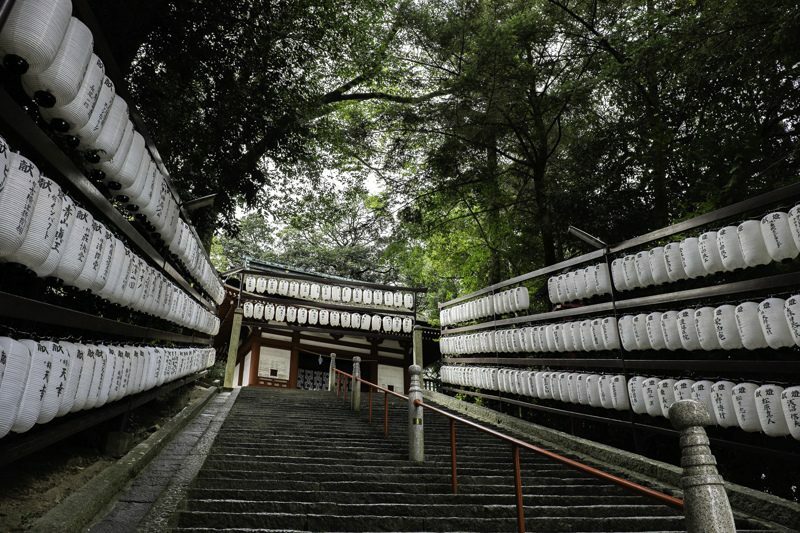 It is over 1200 years old and is graded as one of the three leading Inari shrines in Japan. You will get a real slice of true Japan if you visit it. The beautiful entrance is bordered by statues of golden gods and then there is a wide stairway up to the shrine. The gate is not made of wood, as you would expect, but of stone and styled as an Indian palace. At the back of the shrine, you will find some excellent rock carvings, too. The surrounding area makes a great walk in beautiful greenery. Enjoy this beautiful piece of ancient history! This is a unique temple especially known for its unusual festival held every year in February. It is called the “Naked Man Festival” and is one of the weirdest in Japan. This is the time when you can see huge number of men wearing just a traditional sumo-style loincloth running and fighting excitedly to get some sacred sticks to bring them good luck. If you happen to visit in February, this might be an interesting experience. The place itself is wonderful with a beautiful lake on the temple grounds. There is an interesting pagoda structure, as well as a couple of golden Buddhas and statues throughout the ground of this lovely temple. 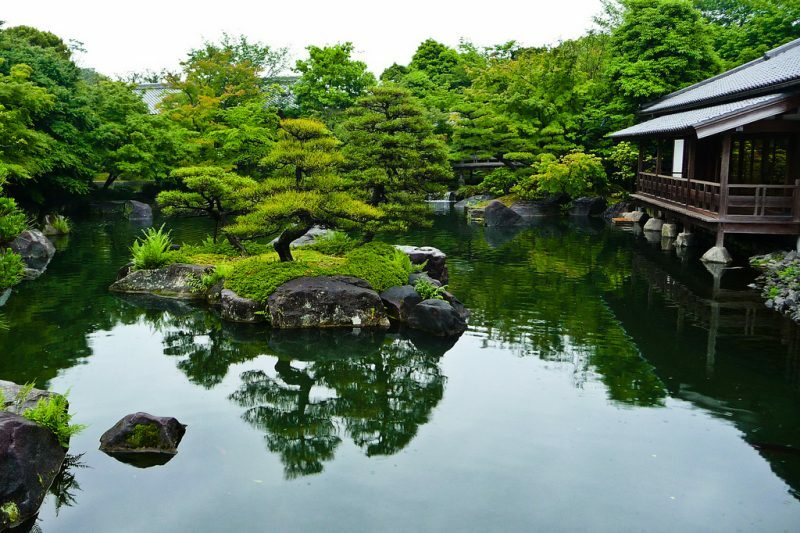 If you visit Okayama don’t miss its beautiful gardens, especially Korakuen Garden which is ranked among three most important gardens in Japan. At first it looks just like any other ordinary park, but when you enter it and start exploring, you get to discover how beautiful this place is. It is really amazing, with a huge pond in its center, a tea plantation with a gorgeous teahouse, water lily ponds, iris gardens and huge green lawns. Every little trail makes an amazing experience and they are all worth the visit. 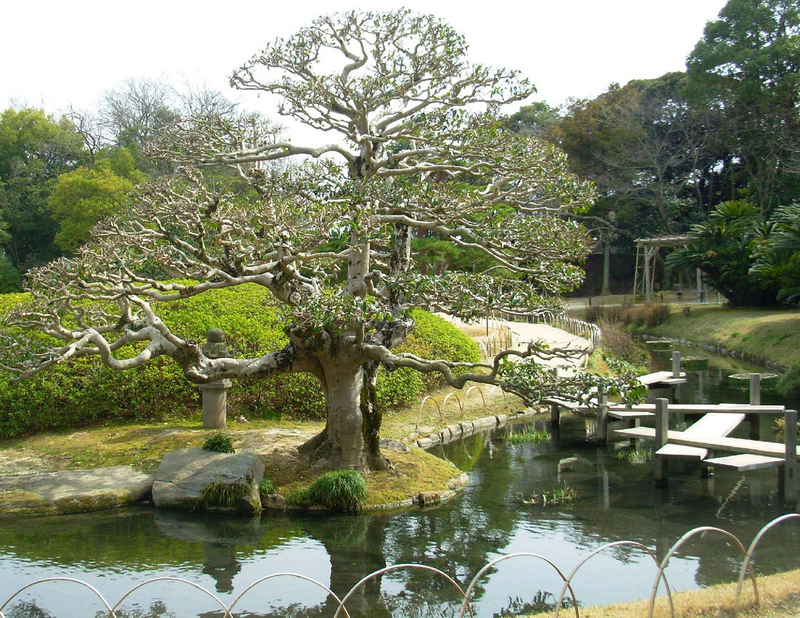 Okayama prides a gorgeous oasis with wonderful flowers and trees in the center of the city. 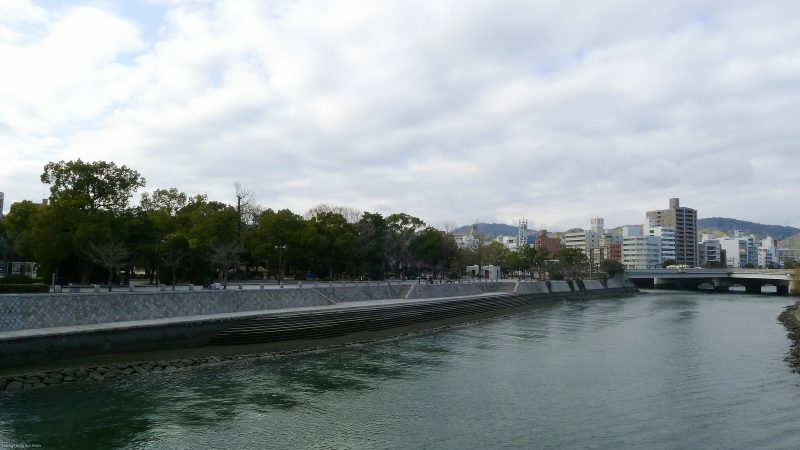 Nishigawa Canal Park makes a great walk on hot days with trees giving the much needed shade as well as the beautiful views. The park features some nice and beautifully crafted stone and bronze works and statues, too. Eight times a year the park hosts the Organic life market with numerous stalls where you can find and enjoy some of the most delicious organic ingredients. If you visit the Okayama Castle and the famous Kourakuen Gardens, you should walk through the adjacent Ujo Park as well. This is a perfect spot to look down at the Kourakuen Gardens and the castle’s surrounding grounds. This park is especially popular in April as one of the most beautiful Sakura spots in the city of Okayama. The castle looks even more beautiful with breathtaking cherry blossoms and there are more than 200 cherry trees in this lovely park. If you want to escape the noise of the busy city and have some nice and relaxing time with your family, Handayama Botanical Garden is the right spot. You will be delighted by the wonderful atmosphere and harmony of the trees, greens and the sky, especially if you happen to be there in spring or early summer when the cherries bloom. The garden is set on a small hill and when you climb its top, you can enjoy one of the best views of the city. It is quite modern and nicely laid out and it offers a wide range of plants. You will definitely enjoy it. If you are a true flower lover, then the Rose Garden is a perfect spot for you. The best time to visit is from May all through to November when a large collection of different roses bloom and when you can enjoy their beauty and smells. Beside the roses there is a variety of seasonal flowers as well as trees in the outer area and the visitors can have a pleasant visit all year around. The park is beautifully maintained and the roses are set up in circular beds with pathways between them so that you can fully enjoy their beauty. There are also various monthly events to keep you entertained. You can even join the gardening classroom and learn about seasonal plants. If you come from a big city, Ikeda Zoo might seem small to you, but actually there are many animals there. The history of this Zoo is interesting, since it used to be a farm whose owner opened it to feed the hungry children after the Second World War. As he loved animals a lot, he kept adding some more species besides ordinary farm animals. That’s how his farm became the zoo. The purpose of the zoo is to educate people about animals and give them opportunity to connect with them. That’s why people are allowed to feed some of the animals and there is a petting area in the zoo. Take your kids and go there, you will spend some quality time together! If you like learning about Orient, go to the Okayama Orient Museum. Learn about art and see interesting artifacts from the Middle East. There are artifacts from different countries: from Persia, Syria, Greece, Egypt, India etc. The exhibits are really interesting and nicely presented. There is pottery, jewelry, textiles, statues, carvings, mosaics and various religious objects. It is a very quiet place and you will enjoy it. Opening Hours: 9:00 a.m. – 05:00 p.m. The Okayama Prefectural Museum of Art is a fine museum which has one important aim, to preserve the cultural heritage and hand it down to future generations. That’s why their exhibits are representative examples of Okayama Prefectural heritage. There are paintings, sculptures, craftwork and various historical documents. There is an archeological section, and the folklore section showing the ordinary people’s life their swords, armors, pottery, ancient crafts, etc. There is also one small section with some modern art exhibits. Inujima Seirensho Museum is located on the island of Inujima and it is actually open in the ruins of an old copper refinery. The place is both beautiful and mysterious and the project of the museum focuses on industrial heritage, art, architecture and environment. The museum is interactive in an exciting way and it is highly recommended that you visit it yourself and find out why it is so great. The whole island offers different installations with the ideas for recycling and they are really worth seeing. This nice museum is dedicated to one of the greatest Japanese painters Yumeji Takehisa born in Okayama. He was also an active poet and illustrator. It is located just next to the Korakuen Garden, so it is a good idea to visit it after a walk through the amazing garden. The art is great, they are mostly paintings of ladies in thoughtful poses. His paintings showing pretty women in kimonos are exceptionally beautiful. Opening Hours: 9.00a.m. – 5. 00 p.m. When you go to the famous castle and its surrounding gardens, you should definitely pay at least a short visit to this small museum set in one of the former guesthouses of Okayama Castle. You won’t miss the descriptions in English, since the museum features beautiful items and you can concentrate only on them and get their true beauty. Enjoy the great paintings, kimonos, pottery, swords, Noh costumes, furniture etc. There is a nice, small lounge area where you can relax and have a look at the building itself and admire its beauty. This residence was once the home of Sugihara who ruled Bit’chu Province. Today it is allowed to walk around the building’s grounds and have a look inside, but it is not allowed to walk inside. Nevertheless, the doors are open, so you can see the artifacts inside the residence at the same place where they used to be when Sugihara lived there. There is also a nice, small garden. 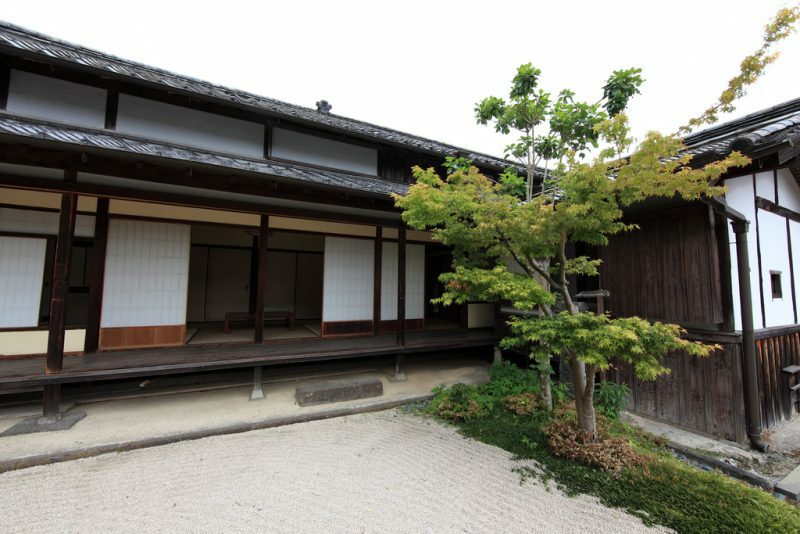 The place is one of the important cultural properties in Okayama. 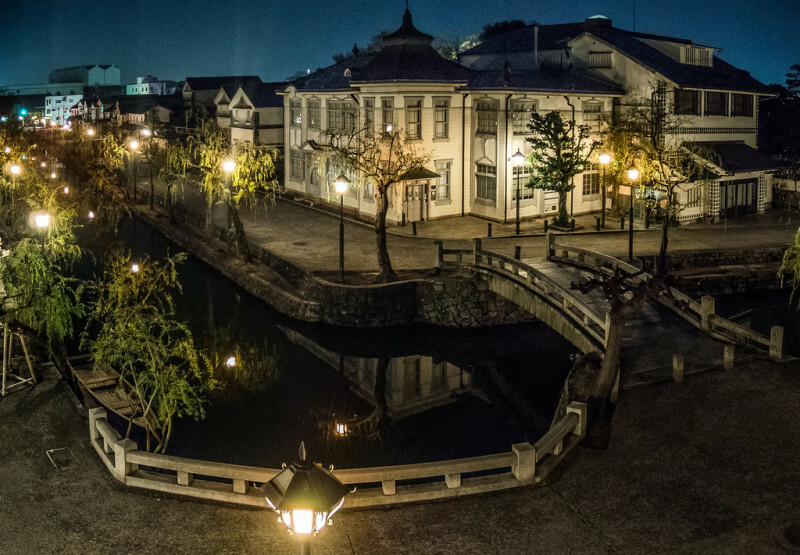 While you explore this wonderfully preserved residence, you will feel as if you’ve stepped back to the time of Edo samurai. If you happen to be in Okayama in October, you should put a small country town called Bizen on your what to do list. 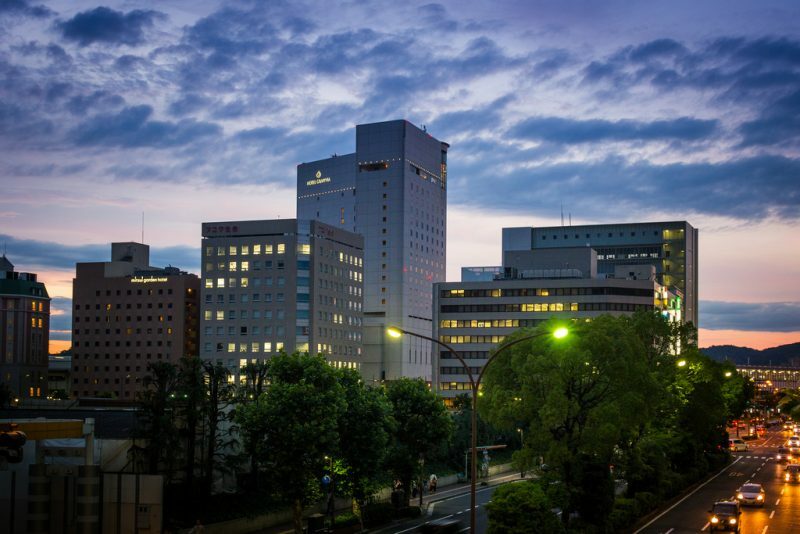 The place is not far away, it is just a short train ride away from JR Okayama Station. Every third Saturday and Sunday in October there is a great Pottery Festival there and if you are one of those who love pottery, this might be a great opportunity for you to buy some really expensive pottery items at really low prices. Many pottery and Japanese culture fans enjoy this fine festival every year. As all other countries, Japan also has lots of folktales and fairytales. One of the most known is the story about Momotaro from Okayama, the boy born from a white peach, who has become the city’s symbol. You will find different books, works and even films that tell the story about this hero who fought the demons or ogres. Its statue and a beautiful peach shaped fountain stand proudly in the city center and today it is a favorite place for the locals to get together. The local super hero Momotaro fought against the ogres from Kinojo Castle. To get there, he had to cross the Kibi Plain with his companions. Today tourists can follow his route on their bicycles following the path which links the cities of Okayama and Soja. This is also an ideal way to see the stunning beauty of Japanese rural countryside. The 20 km long route will take you through rice fields, next to the famous keyhole shaped tombs, some really wonderful temples and five tier pagodas. One of the most popular festivals in Okayama is dedicated to the well- known story about the hero Momotaro. Actually, they have various things dedicated to this super hero. Uraja Parade occurs during the summer festival when you can see lots of dance platforms on the streets. Uraja is a very popular dance in Okayama and the dancers have Ura masks and costumes (Ura was the Ogre from the Momotaro legend) and sing Uraja songs. As most Japanese cities, Okayama has its Joypolis Arcade featuring amusement rides and games all based on Sega video games. Okayama’s game center is just a 10 minute walk away from the station and you can relax by playing flipping tables, hitting taiko drums or you can just try to win one of those cute toys from the crane machines. There is also a bowling area there, and if you come with your kids, they can have fun at the children’s play area. Opening Hours: 10.00 a.m. – 11.00 p.m. The best white peaches in Japan, yes, they come from Okayama. And the city is famous for them. 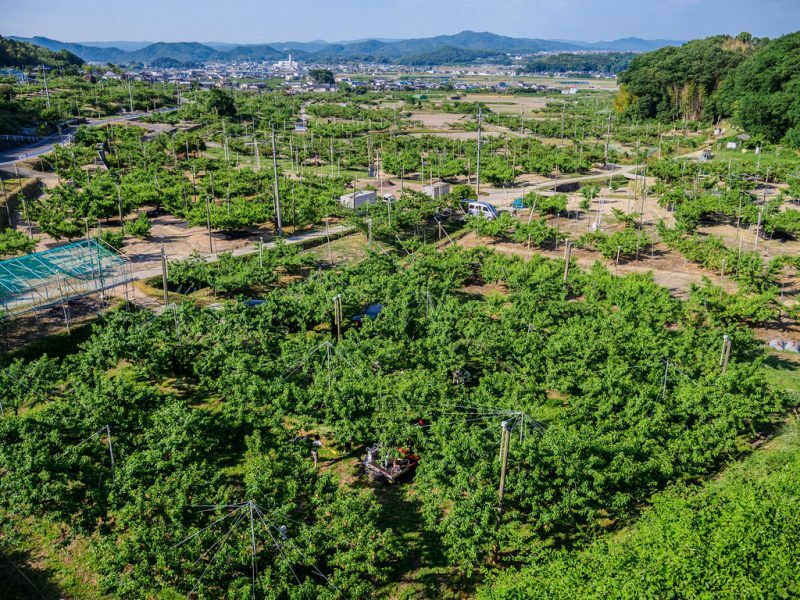 But they don’t produce only peaches, but also a wide range of other fruit such as grapes, strawberries, apples, pears and mikan Japanese oranges. The city is well known for its tasty food prepared with locally grown fresh ingredients, and you can try it at all better hotels and cafes. When it is a harvest time, you can join fruit picking tours and experience picking your own fruit, you will enjoy it! Especially when you taste them in one of the city’s delicacies. If you come to this land of sun in the summer, you must not miss its beaches. 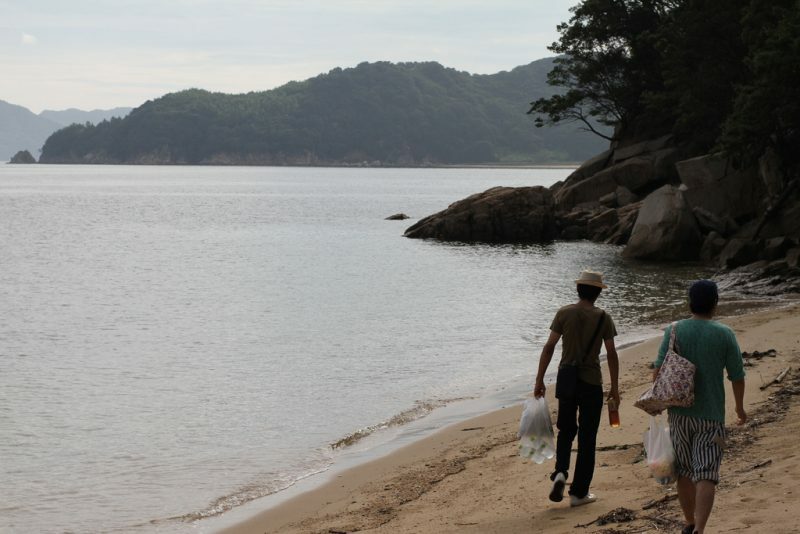 As many other cities, Okayama also has many small “neighborhood” beaches. You can enjoy a relaxing day on one of the beaches with beautiful golden sand. If you stay long enough, when the sun sets down, you can experience one of the most beautiful spectacles – sea fireflies that glow in the sea. Trams were once very popular in Japan. But with the development of the underground transportation they were mostly replaced by modern and fast trains. 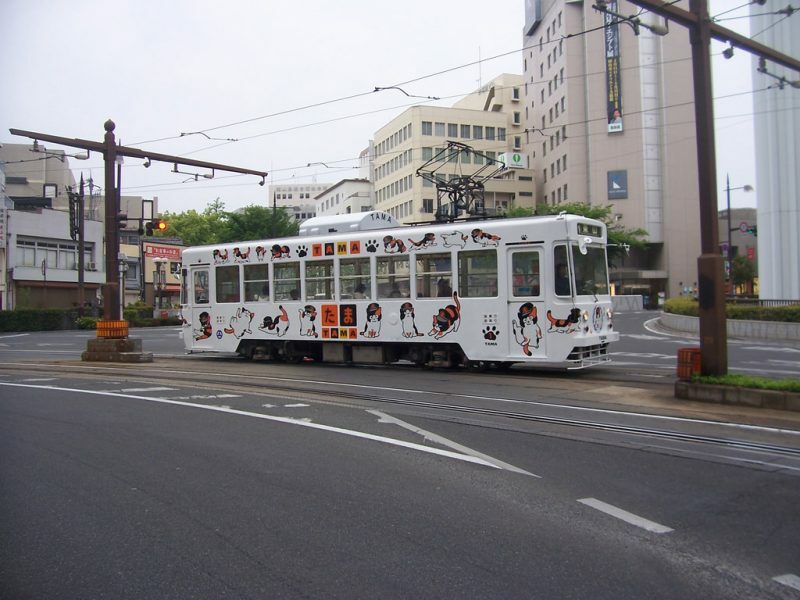 Okayama is one of the cities that still have the tram system which can easily take you to all the important sites in the city. There is even an interesting themed tram ride in the Tamarun cat tram. The trams run from 6 in the morning until 10 in the evening and they can also take you to the city’s major shopping area. 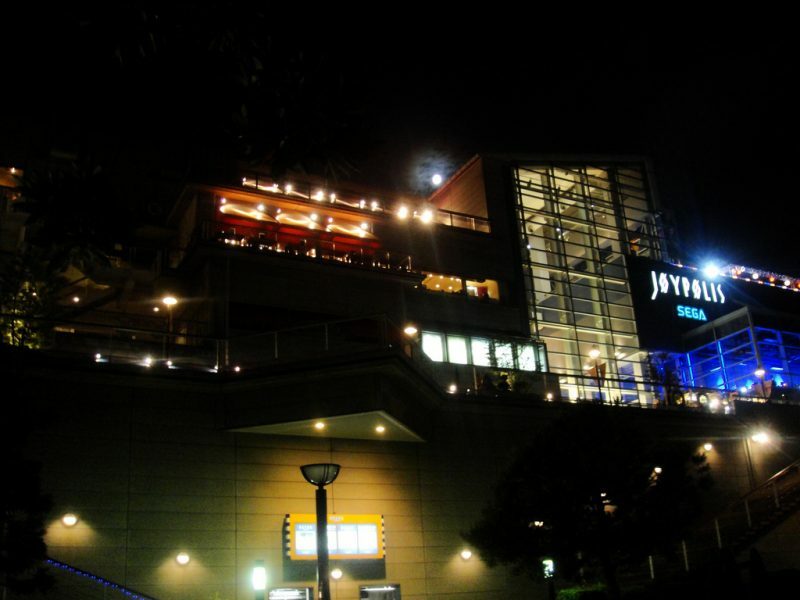 If you like shopping, don’t worry; there are nice places in Okayama where you can spend your money. As all Japanese cities, Okayama has it shopping arcade. It might not be as big as those in bigger cities, but it is definitely very diverse. Okayama’s Omotecho Arcade offers a lot of large and small family run shops which have been there for decades and which have successfully resisted the big shopping malls. You can also try some traditional snacks there or enjoy kibi-dango, the traditional sweet. If you are one of those who are looking for some unique and special items, then this is a perfect spot for you. If you prefer modern shopping areas, then you must go to the AEON MALL in Okayama. 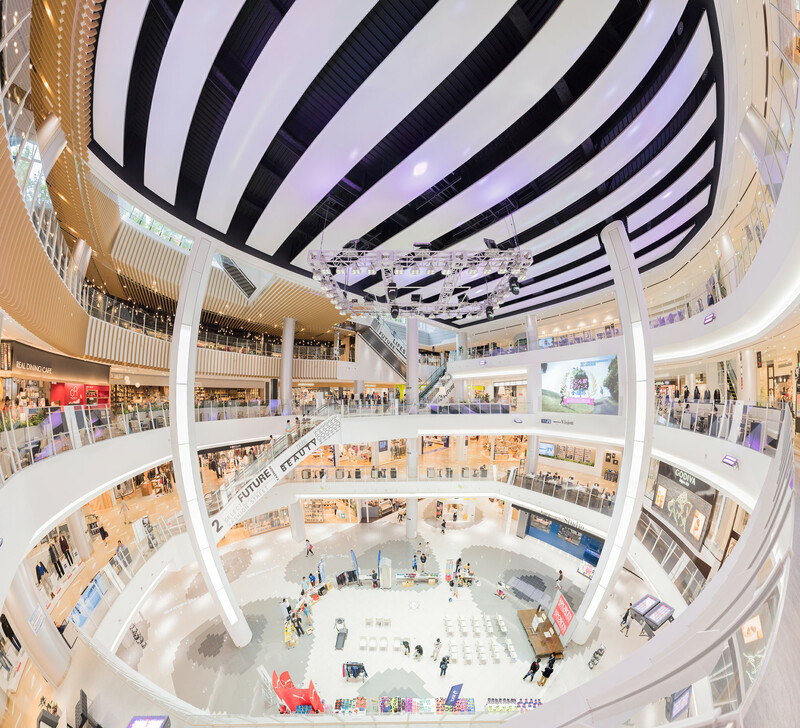 It is the largest AEON mall in this part of Japan and it offers a huge number of various shops. There are shops selling a variety of Japanese clothes and other miscellaneous goods and brands. In addition to shops, the mall has more than sixty different restaurants and a couple of duty-free shops. If you are looking for some nice souvenirs this is a perfect place to find some locally produced goods to choose from. Opening Hours: 10.00 a.m. – 09.00 p.m.
Okayama city has quite nice food and some really great specialties. 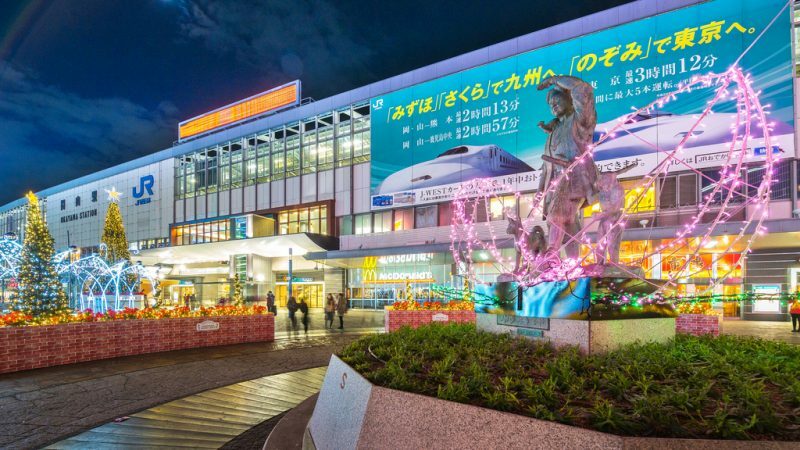 The moment you get to Okayama station, you can instantly find a decent choice of food there. In the city, you can find various restaurants offering quite nice culinary choices. Demi-Katsudon is one of the Okayama’s specialties you should try; it is served in a deep bowl and consists of cooked onion, steamed rice and pork cutlets with different top layers. Or you can choose some Donburi-mono, rice covered with fish or meat, vegetables and other ingredients cooked together. You must never leave the city without tasting the famous fruit parfaits made from Okayama’s marvelous fruits and there are many places in the city to eat them. This is definitely something you must not miss if you come to Okayama Prefecture. It takes just 30 minutes from the city of Okayama to get there by train and when you take a look at it, you will certainly be amazed. It is ideal if you come there at sunset when the bridges are illuminated; the view is simply breathtaking. 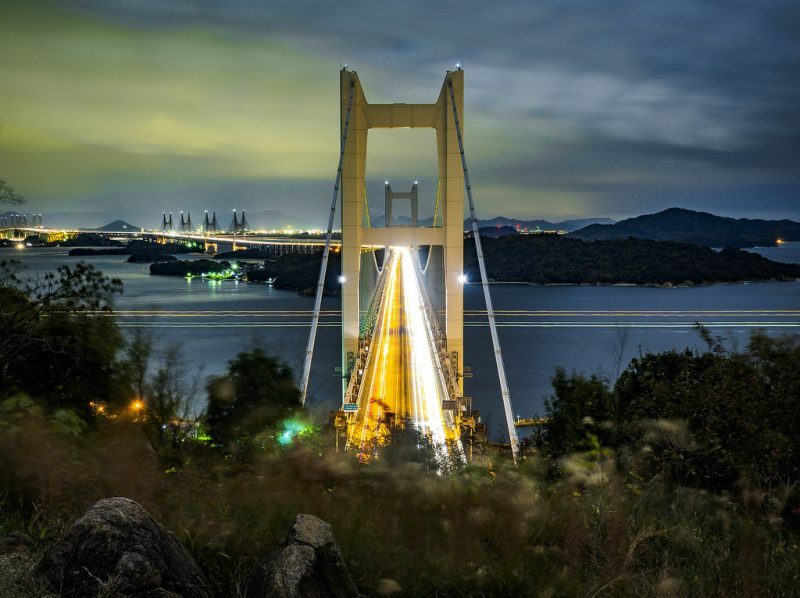 The collection of six bridges consisting of one truss bridge and five suspension bridges connects five islands and it makes one of the most visited sightseeing places in Japan. You can even take a cruise and see it from the sea. When visiting the Okayama Prefecture and Okayama city it can be a perfect opportunity to go to Niimi and see this wonder of nature. 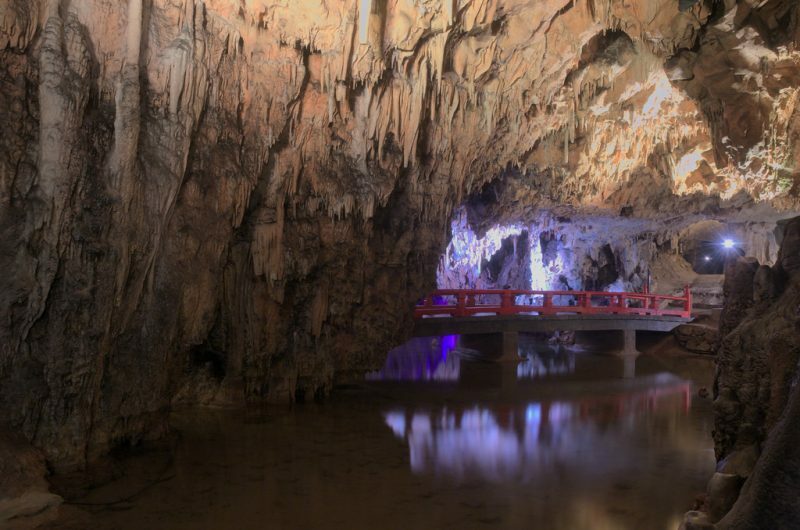 Niimi is a small city famous for limestone caves, and Makido cave is one of them. It is a long cave with an underground lake. Its name actually means “full of mystery”, and it really looks like that. There are great lights all over the cave and numerous stalactites that make you feel as if you are in a fairytale or a mystery film. One interesting point of the cave is a garden pond where you can throw some coins and make a wish. People say your wishes come true. One never knows, maybe you should try it! 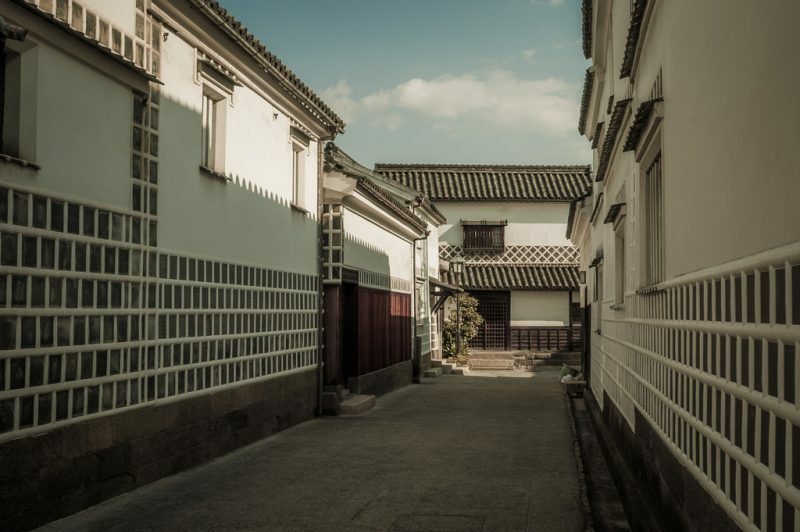 Opening Hours: 08.30 a.m. – 17.00 p.m.
Just 20km from Okayama there is this interesting street which once was a merchants’ and artisans’ district. If you decide to go there, you will have a really interesting and charming walk looking at all those historical houses lining the street. All the houses have been renovated and transformed into many restaurant, cafes and stores. There are also some nice souvenir shops to buy some interesting and unique things for you friends and families. Let’s not forget to say, this place is perfect if you are looking for some good nightlife. As you can see Okayama may be small, but it is still full of various attractions. 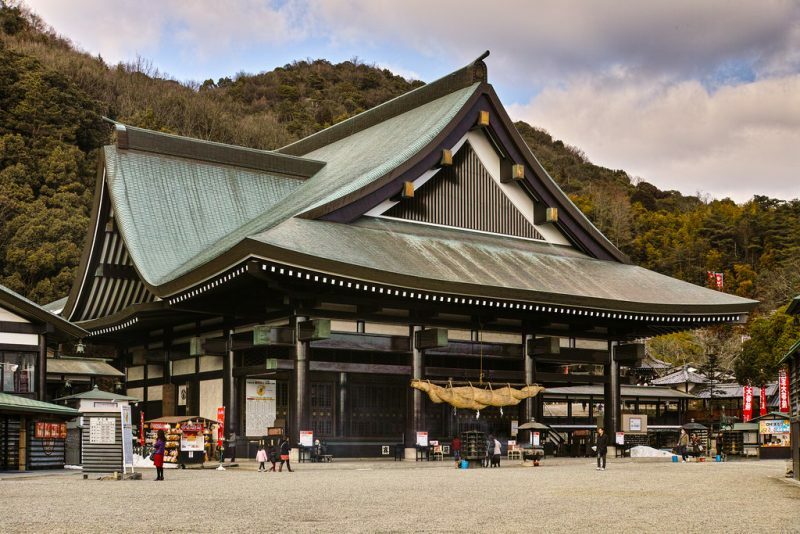 You can experience and enjoy some of the true Japanese history there and it is definitely a place you should put on your list when visiting Japan.